Greetings from Amsterdam. Had two screenings of the movie. Went fairly well. Not hugely attended, maybe 80 for the first, 40 or 50 for the second, but it was 10am Sunday morning. People seemed to respond to the seriousness of it pretty well and were quite attentive. Also almost everyone stayed after for the Q & A and all seemed quite interested. Lots of questions. More people in the first, and still three quarters of the people stayed after, but not overflowing with questions like in the second. The first question everyone had was "What happened to the news seller?" I guess she makes quite an impact and everyone wanted to know what happened to her. the second question was about the safety of the other people who talked in the movie and where they are now. I guess Henrik was one of the people that stood out to them most. And third, they'd ask about my situation now and if I can go back to Cambodia. I think these three were the primary questions at the beginning of each Q & A. Afterwards, a couple of people from each screening would come up and just thank me for making the film, which was nice. They saw that it was an important subject and that I had put a lot into it or put myself at risk in some regard. And the guy from Amnesty said that what he liked most was that I "really sank my teeth into it," got really involved and was not dispassionate about it. I think everyone appreciated the seriousness of it. When I asked the audience if the investigative part was too long or overdone or unnecessary, everyone said no, that it was important. But I'm not sure I believe them entirely. My overall feeling is that the film may still be too rigorous and that it's still a bit of work to get through it to some extent. Which is okay if you bring a prior interest to the movie, not as good if you don't. Agreed. IDFA came at an odd juncture for us -- we've made a movie, but we know it's not the whole movie that we want to make. Now we have several months of editing ahead of us for the public television version, and then we'll build off that for the ultimate full-length version. At least, that's the way I picture it. 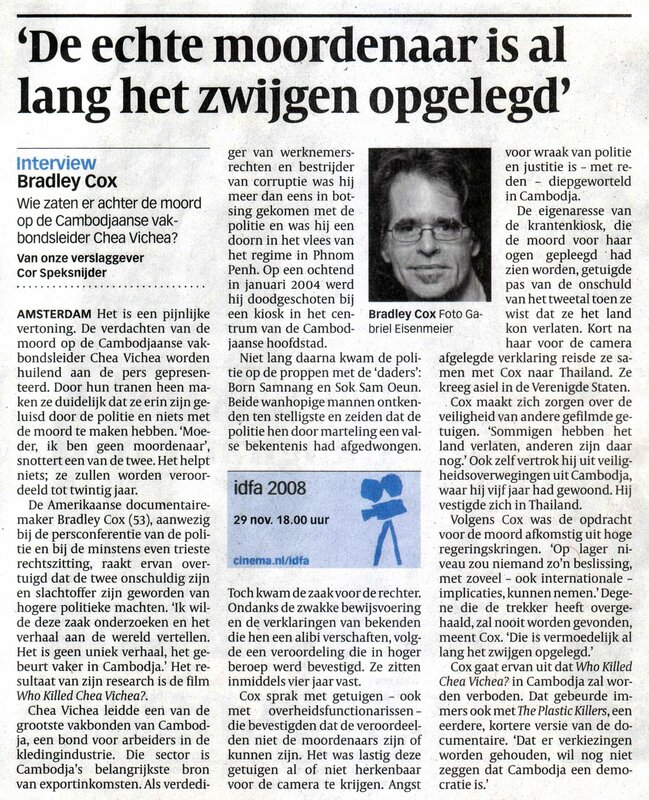 During IDFA, Brad was interviewed by Cor Speksnijder of de Volkskrant, Netherlands' leading quality newspaper, for an article that came out on November 29.
Who Killed Chea Vichea? will make its debut (in current form) at the International Documentary Film Festival Amsterdam in less than two weeks! If you're anywhere nearby, we hope you'll make it. Here's the WKCV page at IDFA. They wrote their own synopsis after watching the version we sent them a few weeks ago. What do you think of it? And how do you get tickets? Right here, starting now. Or at the Box Office in Cineac starting November 14. Standard price only €8.50! If you have friends in or near Amsterdam, this is the time to tell them about Who Killed Chea Vichea? and get them to our screenings. The Movies That Matter screening of Who Killed Chea Vichea? is Saturday, November 29 at 6pm (in Amsterdam). Niets is wat het lijkt in deze zoektocht naar de waarheid achter de moord op oppositiekopstuk Chea Vichea. 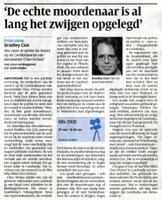 Gaandeweg ontdekt de Amerikaanse filmmaker Bradley Cox steeds meer aanwijzingen dat het corrupte justitieapparaat in Cambodja twee onschuldige mannen liet opdraaien voor de misdaad. De film verkent tegelijkertijd de complexe machtsverhoudingen van het land. More info on that and other screenings is coming soon (in English).